Remove unwanted hair permanently in less time with no pain. Sadhna Art of Wellness offer affordable laser hair removal treatment to the patients. Call us to schedule a free consultation with our laser experts. By using the state of the Art Lasers, we are able to permanently remove the unwanted hair for our patients in less time with little to no pain. The picture to the left was done on one of our patients to show the absolute miracle of this laser. Our laser was used on THE TOP HALF of his back, while the bottom half was just shaved. 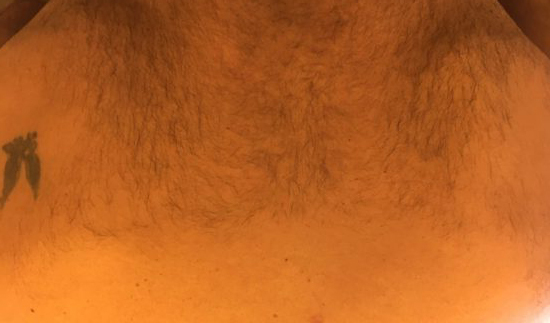 30 days later, you can see the top half is has not grown in, but the shaved part did. Better yet, this was with only ONE treatment.